Located in an excellent setting by the sea with views to the Aeolian islands, Villa Le Sorbe a wonderfully relaxing place to stay with family or friends. Surrounded by extensive private grounds, about 500m away below the house is a secret path which leads from a garden gate, then under a couple of bridges to Villa Le Sorbie’s private pebble-stone beach, an easy walk or drive away. Another pathway from the house leads up through olive groves to a lake and a view over grounds of the villa to the coastline and the mountains behind. 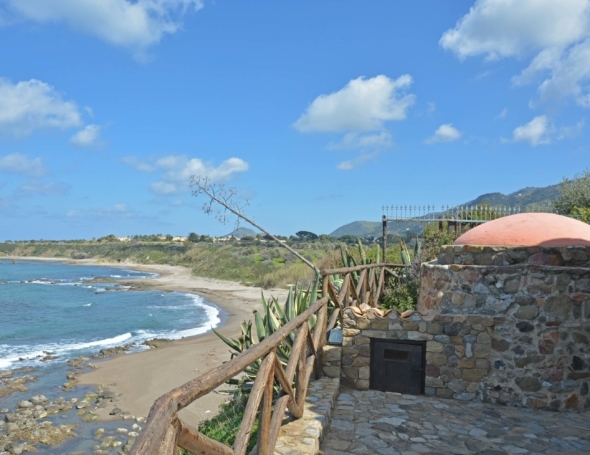 A five-minute drive from Villa Le Sorbe is local shops and restaurants while easy sightseeing trips include nearby Cefalù with its beach and Norman cathedral or Tindari with its Greek theatre and Roman remains. From the villa, you can drive to the neighbouring town S.Agata di Militello where every day you can take a ferry boat to the Aeolian island. 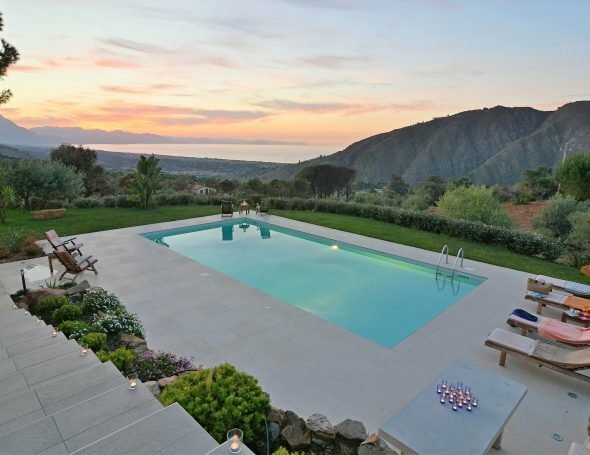 Villa Le Sorbe is two villas side by side sharing a terrace and pool area, ideal for two groups on holiday. The larger house has three bedrooms, an open plan living and dining area and a kitchen which opens out to a shaded outside dining area with barbecue. The smaller home also has three bedrooms, one of which has bunk beds. A living room with a dining table looks over the terrace with views of the sea while the kitchen leads to a shaded outside dining terrace. The larger house: open-plan living and sofa double bed, dining area, kitchen, two double bedrooms with en-suite shower rooms, a twin bedroom with en-suite bathroom. The smaller house: living room with dining table, kitchen, three bedrooms: a twin/double bedroom with en-suite shower room (that may also access from the kitchen), a double bedroom, a bedroom with bunk beds and a shared shower room. We were 14 people ( 8 adults and 6 children) enjoying this fantastic house with a swimming pool where all the six children spend most of their time. The house is situated far from touristic areas and close to a small village where you can buy meet from the local butcher and fresh bread every morning. With car its easy to reach other small villages and beaches. Angelo and Mario took care of us and were always at the hand when you needed some help. A great stay and we can fully recommend the house for a stay in Sicily. The only complaint we have is that the beds were not the best. This is something that has to be improved. Some were very hard and others were more or less suitable as camping beds that's why I have given poor on comfort and only good on condition. What a fabulous villa and location, so calm and relaxing, just what we needed! Two weeks have flown by and never have we felt so chilled; enjoying the call to prayer, peace and tranquility and that is what we got. Thanks to Gabriella for all the information one gave to us regarding sites and for help when we had our puncture! Thank you also to Angelo and MassimoVillas for making us feel comfortable and at home. Perfect location to relax, wind down & enjoy the sounds of the mountains and the fabulous view of the bay. Second visit as good as first. The large outside dining area perfectly located too, near to bbqs etc. So well equipped and well thought out communal areas, particularly loved the outside kitchen. The Staff were truly amazing and absolutely made the holiday – they couldn’t have been more friendly or helpful. We all really enjoyed the holiday.